Pecan Sandies is a fun mixture of micro prints. Shades of lemon, rosy-red, and dark lime mingle with bleached muslin. Crisp lines and classic embroidery make this mini a must! All the pieces are pre-cut, just sit down and sew. Kit is complete and packaged in a bakery bag. Along with a "recipe" to make it, this Sweet Confection, is so much fun! Prints will be identical to picture. 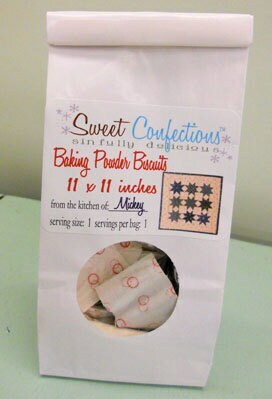 Pecan Sandies measures 11 x 11 inches and is a Sweet Confection designed by Mickey Zimmer of Sweetwater Cotton Shoppe. 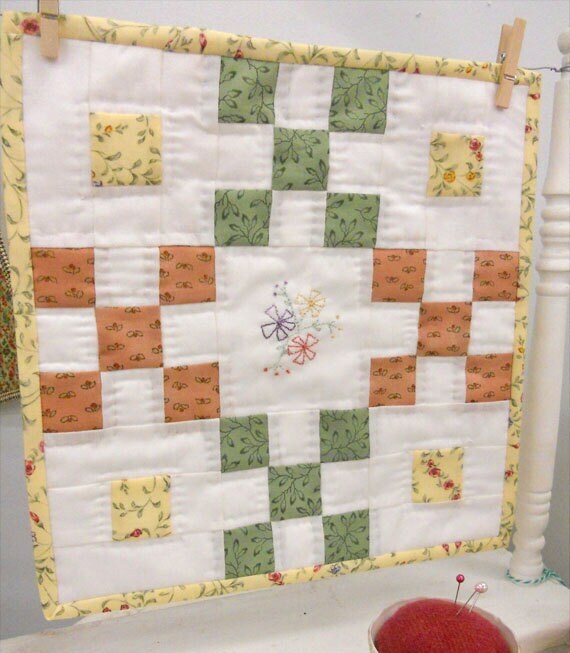 Kit includes: recipe card pattern, pre-cut pieces for the front, binding, and backing. Threads are not included. Picture 2 is the packaging.